Dactek Inkless Footprint Kits offer exceptional value for clean, no-messy ways to take infants' prints. Our Inkless Printing products sold into major hospitals and Baby's keepsake markets world wide. The Dactek Inkless Printing Technology is adapted by US and foreign country law enforcement as the De facto inkless fingerprinting technology. Our Inkless products are certified by FBI as official products for taking classifiable fingerprints for all purposes. Dactek Inkless products have been sold into Governments, Hospitals, and Banks for over three decades. Our products are used with matured and proven technology. The prints produced by our Inkless products are perfect ways to preserve the precious moment and memory. It is also excellent for hospital patient's permanent record keeping. Product meets U.S., and EU chemical safety standards. Simply open the Dactek Inkless towellete apply to the foot or hand, impress to produce permanent imprints on the cards. A typical footprint kit include Inkless towellete (inkless wipe), and coated cards. We are a leading Inkless Technology manufacturer. 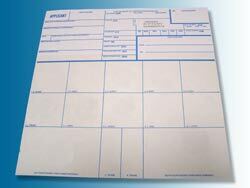 Our products are available in various paper stocks, including archival blank cards, pre-printed forms, and custom forms. Inquiry for volume discounts, distribution information, call us at toll free: (800) 232-2835 (international: (818) 787-1901), or fill in our contact form by click on the "Request Information" button below. Our product specialist will gladly contact you soon.